Yesterday we popped out to do some shopping in Norwich and decided to stop for a coffee. Two drinks and two cakes left us with little change from a £7! We were in an ordinary coffee shop in a small department store, nothing fancy. We joked that in Spain we often wander down to the sea front and look at blue sea, blue sky and palm trees whilst enjoying a tea/coffee and ‘cake of the day’ for 1.50 euro each (£1.35). What a difference! Another regular ‘luxury’ when in Spain is going out for breakfast. There are several places where we can enjoy a full English with a drink for 4 euros each (£3.60). Compare that to a well known roadside café that charges £8 each for a similar breakfast with a drink. Eating out remains remarkably inexpensive in Spain. Menu del dia meals can be found for well under 10 euros (under £9) per person for three good courses and a glass of wine if you look around. Lunchtimes are often less. In the UK 3 courses in even the cheaper café/restaurants will be twice that price, often three or even four times as much in better establishments. So, even with the pound fairing badly against the euro, the cost of those little luxuries that make your holiday that much more enjoyable are still affordable. But what if you live in Spain and need to buy everyday essentials? Recently a leading magazine ran comparisons between countries and Spain came out considerably cheaper overall when compared to the UK. This 2 bedroom apartment has a small front garden, terraced for easy maintenance. On a community with a pool and gardens it is conveniently situated close to the market street in Playa Flamenca. A great holiday home option. On the market at 79,950 euros, but you can make an offer - it's a buyers market. Plenty of space inside and outside this detached 3 bedroom, 2 bathroom villa. On a plot of 890 square meters with a private pool and a garden laid out with mature shrubs and trees it is an ideal re-location villa. Just over a mile to the beach. 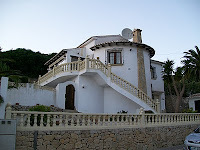 The villa is fitted with double glazing, heating, an alarm, air conditioning, and has both telephone and broadband connections. 2 Bedroom, 2 Bathroom Quad, Playa Flamenca, Costa Blanca south Ref: DIR01Type: Quad Area: Costa Blanca south Town: Playa Flamenca Beds: 2 Baths: 2Pool: YesPrice: €127,000 Description: Exceptionally spacious 2 bedroom, 2 bathroom house close to all amenities in Playa Flamenca. Additional 'winter lounge/guest room' on solarium.Glased porch leads from the terrace into large L shaped lounge and dining room with good size separate kitchen. Downstair shower room. Stairs to first floor with two larger than average double bedrooms and family bathroom. Stairs to solarium with consevatory lounge (could be used as a guest room).20 minutes walk to beach. Shops, bars and restaurants within walking distance. Off road parking. Two communal pools. Older Brits increasingly looking to purchase second homes abroadArticle Date : 08 May 2011 A growing number of older British homeowners have a property abroad, new figures from the Office for National Statistics (ONS) have revealed.One in seven couples nearing retirement age has decided that the best way to secure their future is through a second home, Overseas Property Professional reports.The ONS reports that a significant proportion of the quarter of a million or so individuals have their second home located abroad.It could encourage potential buyers to consider purchasing property in Spain.There are a number of opportunities to pick up a bargain at present, with a number of bank repossessed homes now finding their way back onto the market.This is the first time that the ONS has worked out how many households between the age of 50 and 64 have more than one property. 2 Bed, 1 Bath Apartment in Calpe, Costa Blanca North Ref: NCB278 Type: Apartment Area: Costa Blanca North Town: Calpe Beds: 2 Baths: 1 Pool: Price: €105,900 Description: This 2 Bedroom Apartment with easy access to the Beaches and Facilities of Calpe has 2 Bedrooms and 1 Bathroom. The property benefits from ADSL, Telephone and has SatelliteTV installed for your comfort and enjoyment. The Apartment is ideal for those people who wish to have direct access to all that Calpe offers. The future of sustainable power and environmental stability has taken a huge leap forward, with the announcement of 55 million euro investment in solar power for Lucainena de las Torres. The project, which is currently under administrative processing, will include the installation of 170,000 new solar panels on more than 40 hectares of land, which will make the solar field one of the largest in Europe. Spain is already one of the world leaders in renewable energy, and in particular solar power, with the government committed to increasing the use of cleaner energy to replace carbon power as soon as practical. In terms of power generated, Spain ranks as number 2 in Europe for total energy generated by photovoltaic energy. Four of the ten biggest plants in the world are located within Spain, including the world´s largest plant at Puertollano Ciudad Real. In addition, Spain is one of the world’s biggest manufacturers of solar power equipment, exporting around 80% of all products with particular interest from Germany. If approved, this project, which will be part funded by a German assets company in conjunction with the domestic provider, will become a benchmark and showcase for other developing countries to increase their use of renewable power and therefore potentially increase the demand and manufacture of products for global export. Despite government subsidy for solar power being cut, the manufacturers still believe that the whole process in both worthwhile and will be profitable, largely due to the increased reliability and efficiency of the equipment and agreements made with the Chinese manufacturer of polycrystalline silicon which is used in the process. The site will then generate some 47.5 megawatts of electricity, which is an increase of 26 megawatts on the power already produced. The site generates the electricity through the three photovoltaic fields, as well as an additional three wind farms, which is fed into a substation at Carboneras. Once operational, the expanded site will reduce the carbon emissions into the environment by some 15,000 tonnes each year. Project manager, Soledad Martínez, said that the work could start later this year with the creation of up to 150 construction jobs. Description: Exceptionally spacious 2 bedroom, 2 bathroom house close to all amenities in Playa Flamenca. Additional 'winter lounge/guest room' on solarium. Glased porch leads from the terrace into large L shaped lounge and dining room with good size separate kitchen. Downstair shower room. Stairs to first floor with two larger than average double bedrooms and family bathroom. Stairs to solarium with consevatory lounge (could be used as a guest room). 20 minutes walk to beach. Shops, bars and restaurants within walking distance. Off road parking. Two communal pools. 2 Bedroom, 2 Bathroom Quad, Playa Flamenca, Costa Blanca southRef: DIR01Type: QuadArea: Costa Blanca southTown: Playa Flamenca Beds: 2Baths: 2Pool: YesPrice: €155,000 Description: Exceptionally spacious 2 bedroom, 2 bathroom house close to all amenities in Playa Flamenca. Additional 'winter lounge/guest room' on solarium.Glased porch leads from the terrace into large L shaped lounge and dining room with good size separate kitchen. Downstair shower room. Stairs to first floor with two larger than average double bedrooms and family bathroom. Stairs to solarium with consevatory lounge (could be used as a guest room).20 minutes walk to beach. Shops, bars and restaurants within walking distance. Off road parking. Two communal pools. Type: Quad Area: Costa Blanca south Town: Playa Flamenca Beds: 2 Baths: 2 Pool: Yes Price: €155,000 Description: Exceptionally spacious 2 bedroom, 2 bathroom house close to all amenities in Playa Flamenca. Additional 'winter lounge/guest room' on solarium.Glased porch leads from the terrace into large L shaped lounge and dining room with good size separate kitchen. Downstair shower room. Stairs to first floor with two larger than average double bedrooms and family bathroom. Stairs to solarium with consevatory lounge (could be used as a guest room).20 minutes walk to beach. Shops, bars and restaurants within walking distance. Off road parking. Two communal pools. With some of the best beaches in the Med a day out at the beach can be great way to entertain the little ones and top up your tan at the same time!! A few to choose from in the area are Guardamar, La Zenia and La Mata. Guardamar beach is a beautiful beach BUT the sea can be very dangerous with its undercurrents and rip tides. The beach is patrolled by life guards and has a a red flag policy that MUST be adhered to. La Zenia is a much calmer sea but does get very busy. La Mata has a decked promenade which is great for a nice evening walk! All the beaches are very clean and offer a great family day out. Comments"I have visited all three of the above beaches and can’t fault any of them. All have beach bars so keeping hydrated isn’t a problem (although I tend to take my own refreshments!) We have enjoyed many a family day at all of them all well worth a visit." Research from property company Rightmove Overseas and foreign exchange company Moneycorp showed interest by Britons in buying property abroad increased 53% in February compared with the previous month, according to latest figures.On a country basis, the most searches were for property in Spain, followed by France, the USA and Australia. Robin Wilson, of Rightmove, said: "Bargain hunters are out in force, primarily focused on Spain and Ireland. 2 Bed, 1 Bath Bungalow in La Zenia, Costa Blanca South Ref: HE6252 Type: Bungalow Area: Costa Blanca South Town: La Zenia Beds:2 Baths:1 Pool: Yes Price: €79,995 Description: This 2 bedroom, 1 bathroom bungalow could not be better located, close to shops, bars and restaurants in the heart of La Zenia with the beach being a five minute walk away. This property has a front garden which leads to terrace and then into the lounge/dining area, separate kitchen with door to rear utility area, two bedrooms, both with built in wardrobes and family bathroom. External stairs lead you to the large solarium. The property is being sold unfurnished.